Captain Renault is a Breton knight, and a captain in the Blades. 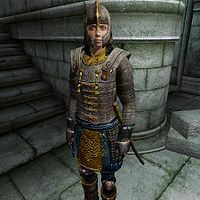 Her main duty is the personal protection of Emperor Uriel Septim VII, a task she performs with the help of her subordinates, Baurus and Glenroy. She wears a full set of Blades armor that cannot be looted and is armed with her Akaviri katana. She also carries a spare steel shortsword and a torch. When Renault appears with the Emperor and the other Blades during the opening quest she is occupied with keeping the Emperor safe with an audible order to lock the doors: "Baurus! Lock that door behind us!" Her attention is then turned to the Emperor himself by his depressing question: "My sons ... they're dead, aren't they?" She futilely attempts to keep his spirits up "We don't know that, Sire. The messenger only said they were attacked." but Uriel is not in the mood: "No, they're dead. I know it." She changes tack to focus on the Emperor's immediate safety: "My job right now is to get you to safety." The Emperor starts to ask about his location: "I know this place ... the prison? ", to which Renault explains: "Yes, your Majesty. Beneath the Legion Compound. We're headed for a secret passage known only to the Blades. No one can follow us through here." At this point she arrives outside your cell and is rather startled to see it occupied: "What's this prisoner doing here? This cell is supposed to be off-limits." Glenroy responds by blaming the common guards: "Usual mixup with the Watch, I ..." before she interrupts with "Never mind. Get that gate open. Stand back, prisoner. We won't hesitate to kill you if you get in our way." Once the gates are open she states: "Good. Let's go. We're not out of this yet." She then walks to the right-hand wall with the Emperor in tow. He recognizes you from his dreams and takes some time out to speak to you. After the Emperor tells you of his dreams and the reason for his being in the prison, Renault impatiently states: "Please, sire, we must keep moving." She then opens the secret passage and tells her fellow Blades: "Better not close this one. There's no way to open it from the other side." After this, if you try to speak to her, she will state: "This is official business. Do not interfere." If you attack her she will warn you with either: "Don't give me a reason to kill you." or "Prisoner, I don't have time for your games. Do that again and die." Through the next room the group is ambushed by the Mythic Dawn and Renault gives one final order before dying: "Close up left! Protect the Emperor!" It is impossible to save her as her death is scripted. Glenroy is the first to notice her demise, stating: "The captain's down!" when she falls. After the fight, the Emperor asks Baurus where she is: "Captain Renault? ", to which Baurus states: "She's dead. I'm sorry, sire, but we have to keep moving." Before you leave the prison for the sewers Baurus will take her's and Glenroy's katanas, if you possess them, and thank you for retrieving them: "By the way, thanks for recovering Captain Renault's sword/my comrades' swords. I'll see that it is/they are given a place of honor in the halls of the Blades. Her initial conversation with the Emperor may not run its full course depending on how long they take to walk down the stairs to the cell. It almost always gets past the point where she says "My job right now...", but will skip ahead from whatever dialogue is next to the point where she demands "What's this prisoner doing here?" as it has priority once she arrives at the cell door. Captain Renault is referred to as "Renote" in the construction set and her script. Her katana and Glenroy's can be found hanging above the fireplace in Cloud Ruler Temple, as both are recovered by Baurus after the Emperor's death. Her katana is called 'Renote's Akaviri Katana' due to the discrepancy noted above. "I warned you to stay out of our way." "Do as you're told, and you'll be all right." Uriel Septim has an unspoken line of dialogue about the captain: "The captain and her men... it's their duty to protect me. I will do as they say."